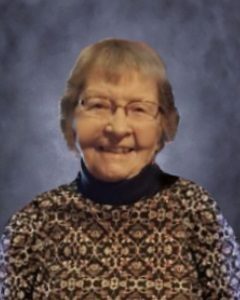 Evelyn L. Johnson, age 95, of Hutchinson, Minnesota, formerly Dassel, passed away on Wednesday, April 10, 2019, at Woodstone Senior Living Community in Hutchinson. Funeral Service will be held Monday, April 15, 2019, at 10:30 A.M. at Dobratz-Hantge Funeral Chapel in Hutchinson with interment in Oakland Cemetery. Visitation will be held one hour prior to the service at the chapel. Evelyn L. Johnson was born on September 14, 1923, in Hector Minnesota. She was the daughter of Fred and Emma (Schuch) Koeberl. Evelyn was baptized as an infant at First Evangelical Lutheran Church in Hector on December 16, 1945. She received her education in Hector, graduating with the Hector High School class of 1941. On June 19, 1960, Evelyn was united in marriage to Russell L. Johnson in Glencoe, Minnesota. This marriage was blessed with one child, Douglas. Evelyn and Russell made their home south of Dassel, Minnesota, until 1986 when they moved to Hutchinson, Minnesota. They shared 26 years of marriage until Russell passed away in 1987. Evelyn was a loving wife, mother, and homemaker. She was a member of Gethsemane Lutheran Church in Dassel. Evelyn enjoyed knitting, crocheting, and helping on the family farm. She also enjoyed attending her grandchildren’s activities. Evelyn especially cherished her time spent with her grandchildren, family, and friends. Evelyn passed away on Wednesday, April 10, 2019, at Woodstone Senior Living Community in Hutchinson, at the age of 95 years. Evelyn is preceded in death by her Parents, Fred and Emma Koeberl; Husband, Russell Johnson; Sister, Lois Grim.